This weekend was an eventful one for our little family as we had parties on both Saturday and Sunday afternoon -- a Kentucky Derby soiree and a one-year-old birthday celebration! Both were equally delightful with an overabundance of good friends and tasty food. In particular, it has been quite interesting to watch the party evolution as many of our friends move from puppies to babies. Jeff and I are still quite content with our big fur baby, but scenes like this do tug at our heartstrings. Two blondies innocently playing fetch is a sweet little scene. 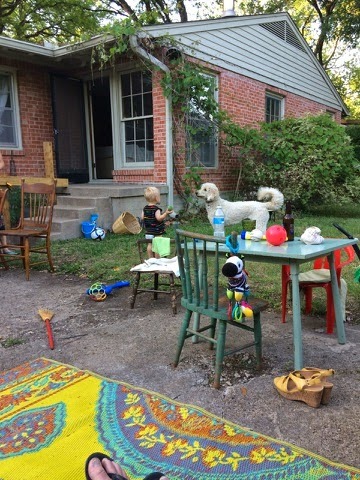 It appears that these two boys, Johnny Five and Milton, like to have fun regardless of the playmate's size, stature, and hair/fur length. Maybe we will consider acquiring one of these human babies someday for the Milt Dog's enjoyment, of course. He might like that.